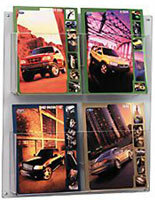 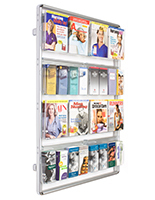 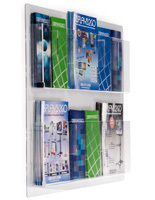 This hanging information rack for mounted trifolds has adjustable pockets (12-24) so a magazine or newsletter collection can be displayed. 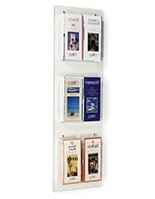 This acrylic leaflets fixture organizes literature on a wall, freeing up space on counters and floors. 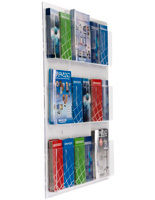 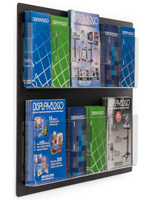 This information rack with four tiers allows materials to be viewed at eye-level. 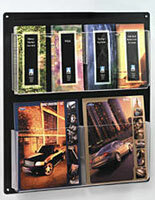 Each of these literature displays houses so many stacks of colorful material, customers will instantly gravitate! 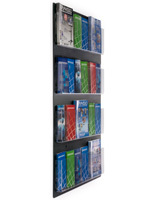 This information rack is a breeze to mount, due to pre-drilled holes, and ships with the appropriate screws and anchors.